The United States on Tuesday offered rewards for information on three senior members of the outlawed Kurdistan Workers' Party (PKK), which has waged a decades-long armed conflict in Turkey. 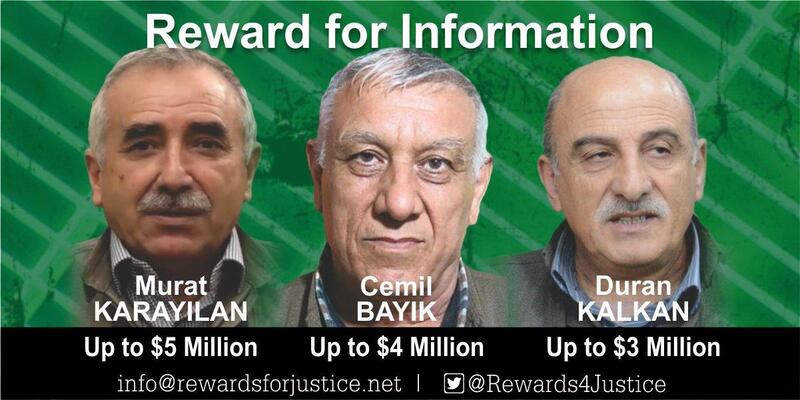 On Tuesday, Washington authorised rewards of up to $5 million for information "leading to the identification or location" of Murat Karayılan, up to $4 million for Cemil Bayık and up to $3 million for Duran Kalkan. The announcement was made by the U.S. Embassy in Ankara following a visit by U.S. Deputy Assistant Secretary of State Matthew Palmer. Turkey has been infuriated by U.S. support for the Syrian Kurdish YPG militant, an extension of the outlawed PKK. Relations between Ankara and Washington have begun to thaw since the release from jail last month of American evangelical pastor Andrew Brunson. Turkish President Tayyip Erdoğan also said on Tuesday that talks with the United States regarding state-owned lender Halkbank, which had been facing a U.S. fine over evasion of sanctions on Iran. Trump and Erdoğan are to meet this weekend at a summit in Paris. Is a new period opening in Turkey's foreign policy?